- Messagebox in One-Click EXE case will be cut to 20 lines of script code. This was not my intention as everythiing should be most transparent as possible but that is just an efficient way to workaround a backend limitation. If any problems, report in! I have newest version of VCDS in English version . Is problem when script contain change of adaptation "aktiv" and not "active" ? is it necessary to change it ? There is a new Version 1.5 available now. It just keeps scrolling adaption list and doesn't enter text to search box. I also noticed that Your program doesn't work with WeChat working. It makes some overlay box. If i quit wechat, script starts to work OK.
Last edited by golfi_vend; 03-09-2019 at 06:25 AM. Thank you, I'll doublecheck that! I just tested your script and it works without any problems. 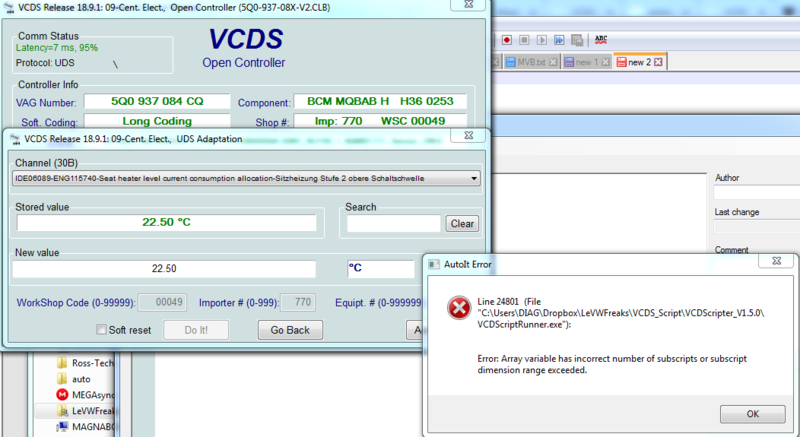 Could it be the case that you use the x86 / 32 Bit Version what you explicitely activated during the installation wizard of VCDS? Some people seem to have problems with changing adaptation channels in Unit 09, and only in Unit 09, what does not make sense for me at the moment.